Big wheel scooters are a staple of mainland Europe, used by men and women of all ages to ferry themselves and their families across bustling towns and cities. With unparalleled levels of comfort and impressive returns on fuel, they are a commuters' dream – allowing riders to scythe through daily congestion and spend less time at the pumps. The Peugeot Belville 125 scooter is a classic case in point, with all variations using the same 125cc liquid-cooled Smart Motion engine, producing 11.1bhp, which gently sips fuel, regardless of how aggressively you wind on the twist grip. If you lived within 15 miles from work and didn’t have to touch a motorway to get there, the RS model we tested would make perfect sense as a machine for getting from A to B. However despite their obvious benefits, the popularity of big-wheeled scoots appears to have left the UK behind - perhaps it's time we wised up! 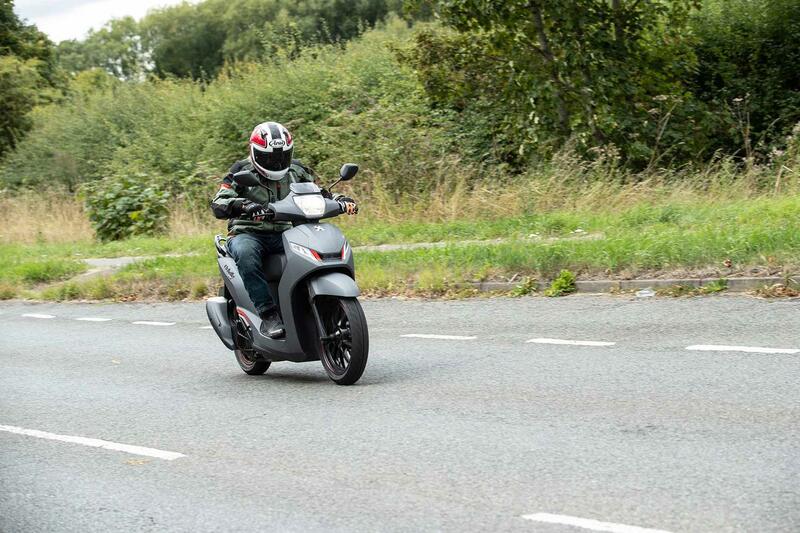 Despite being designed for inner city streets, our 300 mile test route comprised of urban areas, dual carriageways and rutted countryside B roads, allowing us to gain a full picture of how the Belville behaves in all conditions. With well-damped conventional forks to the front and chunky dual shocks to the rear, the Belville rides over most bumps in the road with ease, remaining comfortable in a variety of scenarios and making it ideal for tackling the cobbles, tram tracks and manhole covers that litter all cityscapes. Taking the bike out of its comfort zone, the Belville is let down slightly over deeper potholes, with both the front and rear springs crashing hard – using their full suspension travel to fend off the cracks. The rear 75mm springs offer three levels of adjustment though, meaning there is potential to dial this out. That said, it is important to remember that the bike is not designed to be used in these environments and so can be forgiven for struggling. Away from the suspension though, the bike’s larger 16in front and 14in rear wheels actually mean it handles itself well when the going gets twisty, so it is a shame that the suspension isn’t up to the job on occasions. Thankfully, to help balance out the bumps, the Belville also comes with a thick, comfy seat, which offers plenty of padding and comfort by the bucketload, regardless of your time in the saddle. 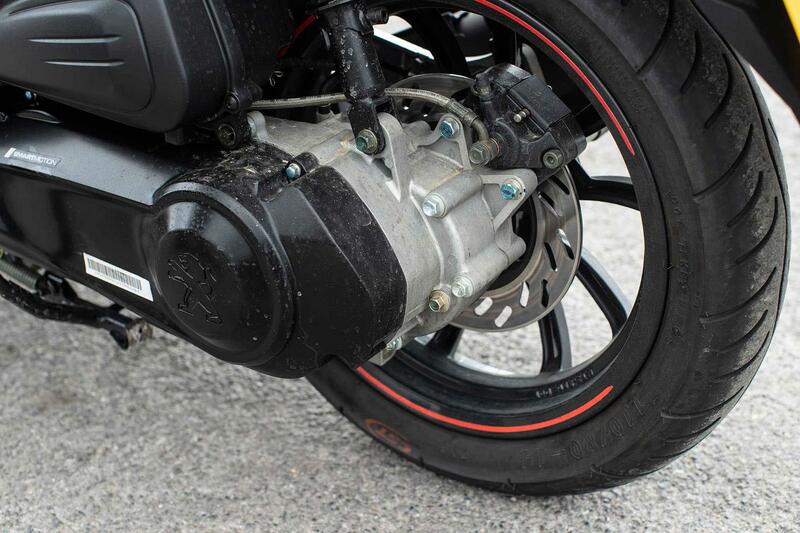 What’s more, when you do lean the bike over, there is plenty of ground clearance between the footboards and the floor, meaning you can maximise all of the CST tyres, which grip the tarmac adequately in all weather conditions. In order to comply with Euro4 regulation, the Belville 125 has been fitted with the firm’s new liquid-cooled SmartMotion engine, which uses a patented new feature that Peugeot are calling 'Alternative Current Generator' management. What this essentially means is that the system disables the flywheel during acceleration and deceleration phases when the battery is sufficiently charged, which in turn increases fuel economy by 5% and delivers more power when pulling away. This is handy when filtering to the front of queues, with the tiny engine still having enough go to comfortably out-accelerate and stay ahead of the rest of the traffic when the lights go green. Once on the move, the engine is silky smooth, thrumming away delightfully with a gentle purr from its bulky pipe. 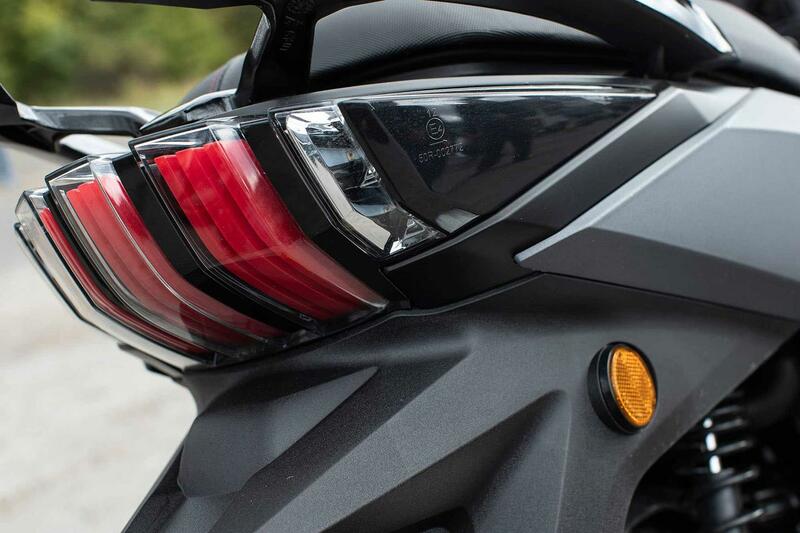 The throttle response is also crisp and direct, with minimul jerkiness with rider input. It’s a different story at standstill though, with the engine producing serious vibes through the bars and mirrors. Peugeot offer a figure of up to 113mpg, however on our 100-mile test route across country lanes, towns and dual carriageways, we were only able to achieve 92.9mpg, which is still impressive considering we were also fully laden with bags and had equipment under the seat. The Peugeot feels very well-built. Although largely consisting of plastic panelling, there are no sizable gaps or cheap fixings and despite its £3099 2018 price-tag, it feels like a quality product. A two-year manufacturer's warranty also means that any unwanted mechanical gremlins should be relatively easy to fix, too. 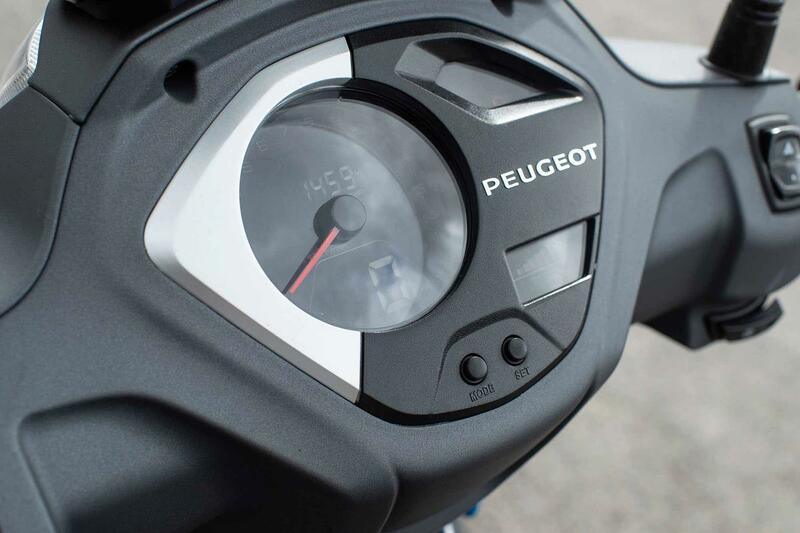 Costing £3099 and coming with a two years manufacturers warranty, the Peugeot Belville 125 boasts great value for money. 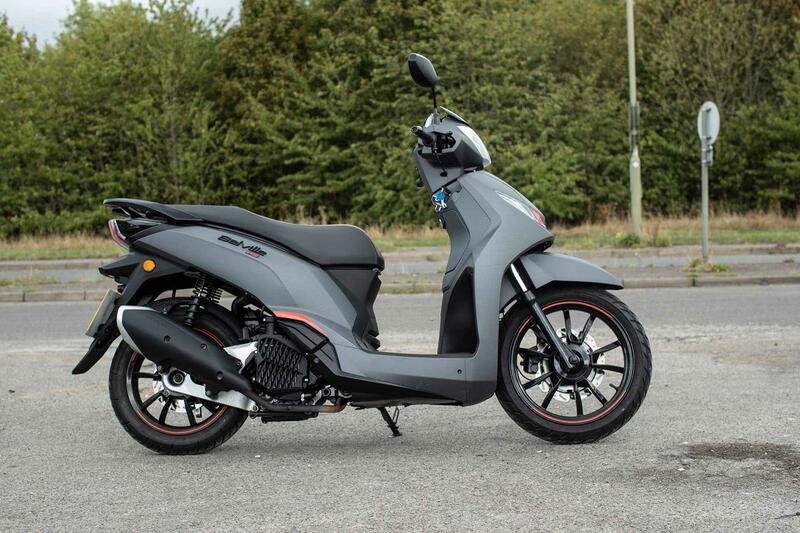 Using the firm’s own suggested finance examples, the bike is yours for an affordable £226 a month over 12 months, when you pay a deposit of £574. Alongside this, the near 100mpg fuel figure also means it is kind on your wallet at the pumps, before breaking through city congestion with ease. This is a bike that could save you serious money on your commuting costs, meaning no more need for ever-pricier bus and train tickets, or less time sat stationary in your car during the daily grind. A scooter has and always will be a city-biased mode of transport and, as such, should house the latest in security devices to combat against the growing spate of scooter thefts in cities like London. Unfortunately, the Belville - despite being named after a district of Paris - is equipped with only a flimsy steering lock and an immobiliser switch under the seat. Located near the fuel cap, the switch can be put in either the 'lock' or 'unlock' position, with the lock setting rendering the bike unable to start. This works very well and caught this untrained road tester out, leaving me stranded in the rain for an hour while I tried to figure out why it wasn’t turning over. 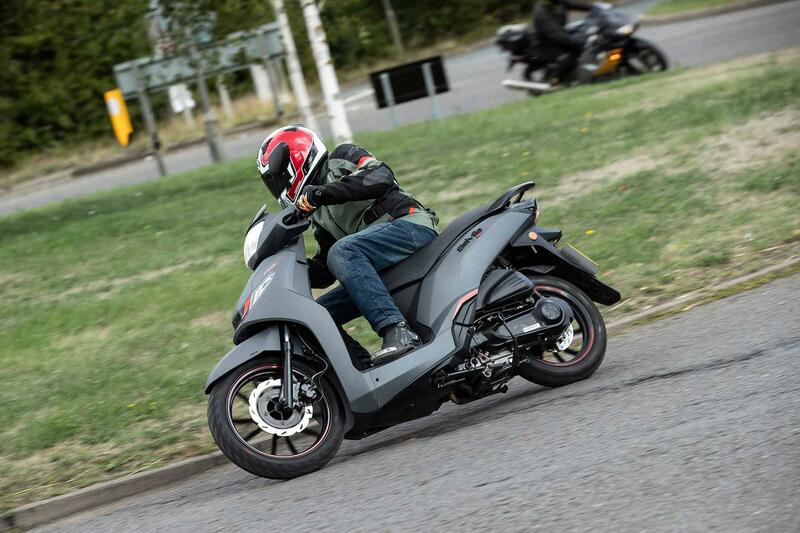 Away from the immobiliser, the lock feels easily snapabl and with no inclusion of an additional handbrake, it potentially allows any would-be thieves to simply break the mechanism before strolling away with your bike. Despite this, the large under seat storage area, which is capable of storing a full-face crash helmet, offers plenty of space to carry additional locks and chains. Other storage consists of a neat locked front section, which would be ideal for essentials like phones, wallets and keys. Upfront, the neat, centralised clocks are easy to read at any speed, housing daily essentials like your revs, speedo, trip meter and even a fuel gauge, which ticks down to zero before displaying a fuel warning light. A handy plastic fly screen also allows for some wind deflection, meaning less buffeting against your head at higher speeds. Indicators both left and right are within easy reach of your left thumb, however deliver an embarrassing beeping tone with every flash, to remind you they are active. Although a useful safety feature, it removes all sense of street cred, as you beep away at the lights like a low-rent heart monitor. The Belville range was launched towards the back end of 2017, before finding its home within the French firm's 2018 range. The bike we tested was the Belville 125 ABS RS, however there are three other versions of this city scoot also currently in production. These consist of the standard Belville 125, as well as a 200cc model and a 200cc RS model, too. Both the standard and RS models are inherently the same, with the RS getting a sportier grey, black and red paint scheme. Alongside these bikes, Peugeot also produce the Citystar, Django, and Kisbee, as well as a Metropolis three-wheeler. 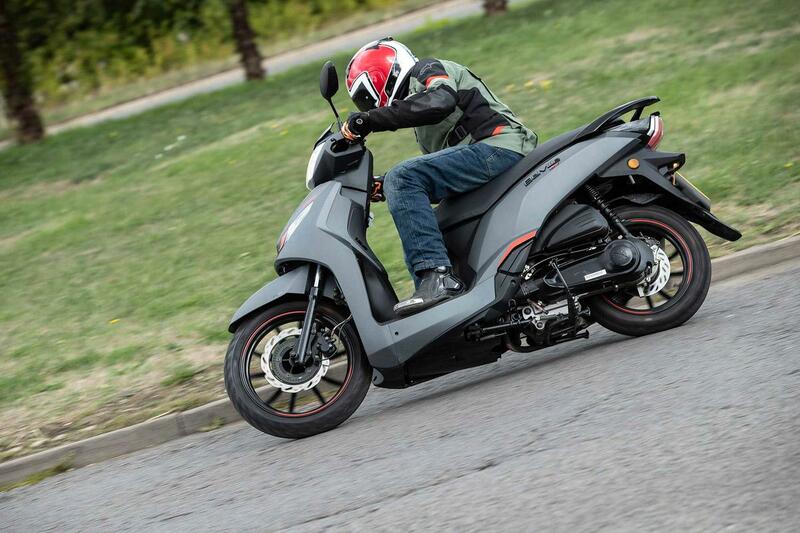 No owners have yet reviewed the PEUGEOT BELVILLE 125 (2018-on).